Workmen laying tram rails in Marlborough Place, opposite the King and Queen public house. 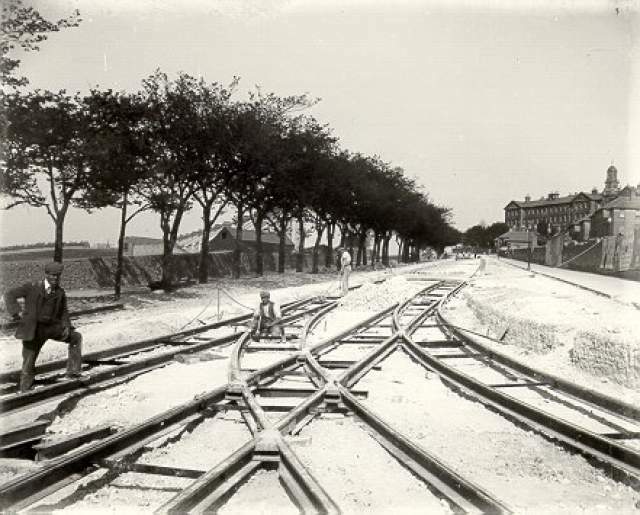 The tram service began along this route on 25 November 1901, although the network was not completed until 1904. The bow-fronted Georgian King and Queen was replaced by the current red-brick timber-framed building in 1931-32.
a) ESTABLISHMENT and ROUTES: Schemes for tramways were suggested in 1864, 1879 and 1883, but the corporation’s electric tramway system, authorised under the Brighton Corporation Act of 1900, commenced service on 25 November 1901 when the first car was ceremonially driven by the mayor, John Stafford, from the initial terminus at the southern end of Victoria Gardens along Lewes Road to Preston Barracks. Fares were charged initially at one penny for any distance. Special services were operated on race days, and also to Dyke Road when Brighton and Hove Albion played at home. 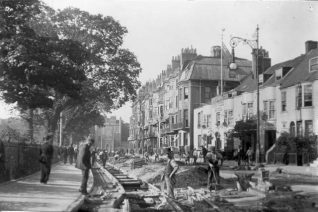 Frequencies of four to five minutes were operated, and typical journey times from the Old Steine were: Brighton Station (8 minutes); Fiveways (18); Preston Barracks (15); Race Hill (18); Rock Gardens (27); and Tivoli Crescent (20).